Durr VSA300 amalgam pots, stop the blasted beeping! Home » Blog » Durr VSA300 amalgam pots, stop the blasted beeping! 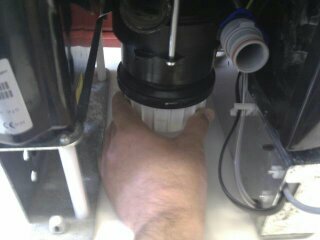 #4: How to change the Amalgam Pot on a VSA 300.. without breaking it or skinning your knuckles. 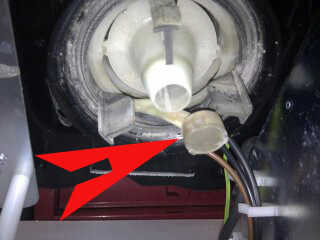 Incorrect removal of the amalgam pot can cause the unit to beep, constantly. 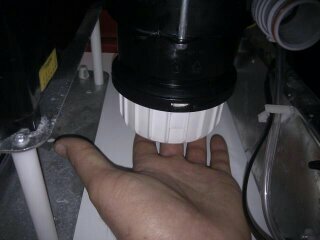 Unless you are underneath the unit when you remove the pot you will not be able to see the sensor, what sensor you ask? This one! "See the grey disk above? A sensor!" The Durr VSA300 dental vacuum unit is one of the most common units used in dental surgeries. They are quiet, powerful and fantastic value for money, they are easy to tuck away out of site and they can tolerate a long run of pipe between it and the suction manifold or handpieces without a significant loss of power. They are easy to service (we can strip one down and put it back together in an hour) and they rarely break down unless you do not clean them. Changing the amalgam pot is fraught with danger however so there’s a knack to it.. and here it is. 1: Place hand underneath the pot and twist SLIGHTLY to loosen, there is just enough room to get your hand under but there is not enough room to remove the pot with your hand like this, so just loosen it. Now carry on unscrewing thepot with your hand around it not under it. When it is unscrewed enough drop it to the floor DIRECTLY underneath and slide the pot out towards yourself. When the pot is resting on the floor there is only 2 or 3mm between the top of the pot and the sensor. If you do NOT let the pot touch the ground BEFORE you slide it out towards yourself then you risk ripping the sensor off.. worse still is that because the pot will be full of cloudy water you will not notice you have ripped the sensor off and you will throw it in the amalgam safe . The unit will then beep, and beep, and beep ! Replacing the sensor is an hour long job as the whole separator housing has to come apart.. you have been warned. Read our blog on how to know if your unit needs a service. Next time: #5 How to diagnose a collapsed suction tubing.